Mastery Experience Workshops™Arthur Maxwell, Inc.
Providing participants real experiences that are relevant to their success helps us deliver on our promise to equip them for the future. Arthur Maxwell Mastery Experience Workshops™ are based on what most of us instinctively know, and what those who study human behavior have proven—Experience Matters! Our workshops honor the adult learning model and the powerful insights of Social Learning Theory to bring to life deep subject matters and engage people's natural capability to learn from experience. Our Workshops create very specific scenarios that closely model the real world. Participants leave with a mastery experience under their belt and the confidence that is so important to success. The workshop was great, it was exactly what I wanted, needed, and expected. My confidence has grown tremendously from this workshop. Join us for an upcoming workshop or contact us to bring in-house. During this 5-day, hands-on, interactive workshop, participants will learn all they need to know to pass the PMP®/CAPM® exam—guaranteed. Through the use of our iPad® simulation participants find themselves immersed in the project management situations they will find on the exam. This intense 3-day workshop brings together Project Management and the DMAIC methodology used in Lean Six Sigma. 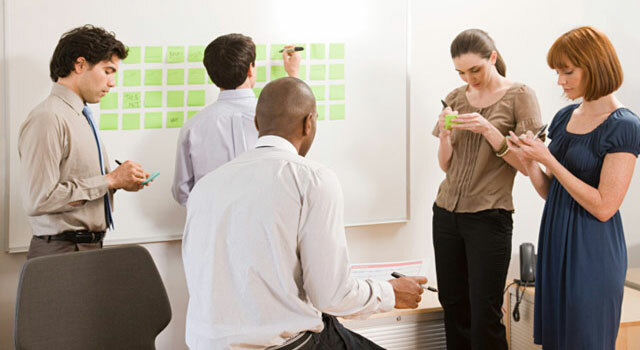 Participants will experience a rich Lean Six Sigma project simulation immersing them in the people and project challenges they are sure to encounter on their real projects. This fast paced 2-day workshop is designed to demonstrate how programs strategically serve the organization, and to help business leaders leverage what they already know about project management, leadership, and change in order to succeed with programs. Anyone who must achieve prescribed results on time and within budget will benefit from this intense 3-day workshop. Participants will experience a project from beginning to end while using fundamental project management tools to plan, execute and steer the project. Storytelling for Leaders is a one-day workshop that will introduce participants to storytelling as a powerful leadership skill and then help them find, create, and tell their own stories. This workshop will help participants use story to create a super-highway connection to their audience—whether in front of a large group, working with a small group, or even during a one on one conversation. This intense 2-day workshop is based on the research of Jim Kouzes and Barry Posner and is designed to equip leaders with knowledge and tools to take their leadership to the next level. The workshop utilizes the LPI Online® to gather 360 feedback in support of participants' development. Designed to move leaders beyond the foundational Leadership Challenge® knowledge they have acquired previously, participants will deepen their self-development and expand their use of the 5 Practices to develop team members. This highly interactive 2-day workshop demonstrates how the four personality dimensions (developed by Katherine Briggs and Isabelle Briggs-Myers) manifest themselves in every person and how participants can use type to be more effective in their work and personal lives. Prior to the workshop participants take the MBTI® Step II™ survey on-line, and receive the extensive MBTI® Step II™ Interpretive Report with their results. Organizations don't change. People change (or nothing changes). This powerful 3-day workshop gives participants actual experience with multiple, and sometimes simultaneous organizational and personal changes. This 2-day workshop is designed to equip leaders with the knowledge, tools and techniques to take their teams to a higher level of performance. Participants will see how their team stacks up to the high-performance test and learn how to get their teams on a higher-performance path. To gain the most out of this workshop, attend with your team members and receive pricing discounts. Gone are the days of endless slide shows, nauseating lecture and passive sleepy audiences. Past approaches to training have nothing in common with Arthur Maxwell workshops. Our workshops involve rich simulation, engaging multi-media, intense interaction, and are led by instructors with deep subject matter expertise, top-notch facilitation skills, and an understanding of how to invoke the human ability to learn. Even better than trial and error our workshops are carefully designed to include the scenarios we know participants will encounter sooner or later (and some they already have). Each workshop repeatedly expresses what participants need to know, models effective techniques and methods, invokes past personal experience and provides opportunity to actually gain new experience while interacting with others in a very real and very safe environment.